Is Yours an Accountable Organizational Culture Where Actions Rise Above Excuses? Your leaders are expected to have their fingers on the pulse, so that they can sharpen your organizational culture, on-going. Victim-thinking. The &lquo;oh-poor-me/us&rquo; victim mindset is really only a way to avoid self-reflection and accountability. “I deserve” goes along the same lines. Procrastination. Are you hearing, “I’m waiting on others to provide me…” or “We are waiting on a decision from…” When teams are constantly playing the waiting game, as heard in their conversations, this may be a quick tell of poor accountability. Lag-time. In a highly accountable environment, peers call each other out immediately and in a respectful yet accountable way. They don’t allow too much time to pass for resentment to build when someone is not pulling their full weight. They do not have triangular conversations about each other. Rather they quickly identify and address issues with little lag time. One of my clients empowered every manager to consistently ask one question of employees: What did you do, today, to move the organization’s goals forward? You can only imagine how accountable every team member became. Accountable leaders work diligently to maintain company-wide focus on the achievement of the organization’s most critical business goals and drive towards results. 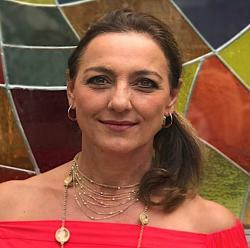 When most conversations are about taking action and finding solutions vs. finding excuses, you may be on the right path towards, or may have already achieved, an accountability culture. Well done! 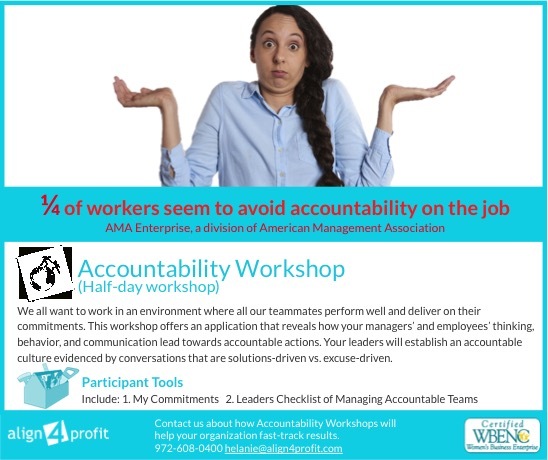 If not, consider taking your employees and leaders through an action-packed exploration into how personal accountability can be sparked by attending our Accountability Workshop. I would love to hear how you might characterize poor accountability in your environment.